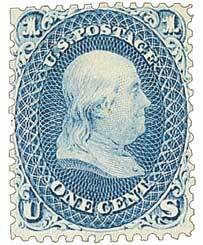 U.S. #1 features a Franklin portrait that had previously been used on banknotes. Benjamin Franklin was born on January 17, 1706, in Boston, Massachusetts Bay Colony. 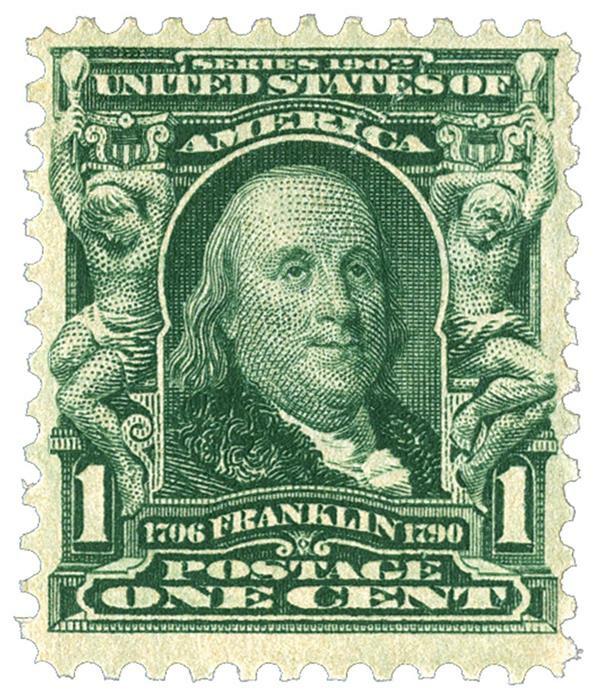 Franklin was the son of a soap and candle maker. As a youth, Franklin learned these trades, but found them unsatisfactory. So he became an apprentice to his brother Richard, a printer, at the age of 12. It was in this apprenticeship that Franklin started what he considered his primary, lifelong occupation – printing. U.S. #63 was issued for use during the Civil War. During this time Franklin also wrote many articles that were submitted and published under the pseudonym “Mrs. Silence Dogood.” These writings demonstrated his unique wit, humor, and insight. However, when his brother discovered that Benjamin was the author of the articles, he refused to publish them. The two brothers quarreled frequently, and at the age of 17, Franklin ran away and settled in Philadelphia, Pennsylvania. U.S. #112 from the popular Pictorial Series. 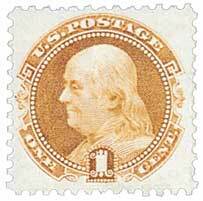 From 1723-1730, Franklin worked for several printers in Philadelphia and in London, England. In 1728, at the age of 22, he was able to become a partner in a print shop. Just two years later, he became the sole owner. Franklin published The Pennsylvania Gazette from 1729 to 1766, and wrote nearly all of the paper’s content. It became one of the most famous newspapers in the colonies. Historians credit Franklin as the first newspaper editor to publish a cartoon and to include a map with a story – everyday practices in modern newspapers. U.S. #1140 from the American Credo Series. From 1733 to 1758, Franklin published Poor Richard’s Almanac. He wrote the almanac under the name of Richard Saunders, an imaginary astronomer. Poor Richard’s Almanac included astrological information, jokes, poems, and weather predictions. One of the greatest features of the almanac was Richard’s proverbs, which reflected Franklin’s philosophies of thrift, hard work, and simple living. 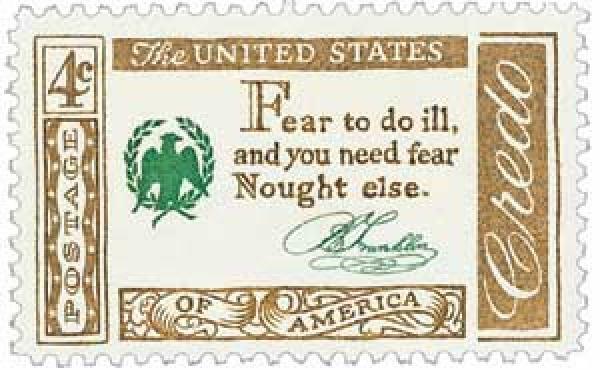 One of these sayings is featured on the Franklin “Credo” stamp above. Aside from his publishing work, Franklin flourished, and his accomplishments and contributions to the city earned him the title “The first citizen of Philadelphia.” Franklin’s many contributions to the city of Philadelphia include: founding the first subscription library in the American colonies; organizing the city’s fire department; law enforcement reform; leading efforts to pave, clean, and light public streets; raising money to build a city hospital, the Pennsylvania Hospital; and founding the academy that became the University of Pennsylvania. Franklin was also an important inventor and scientist. He discovered lightning was electricity, and created such terms as armature, condenser, and battery. U.S. #300 was based on a painting by J. B. Longacre that hung in Pennsylvania’s State Capitol. 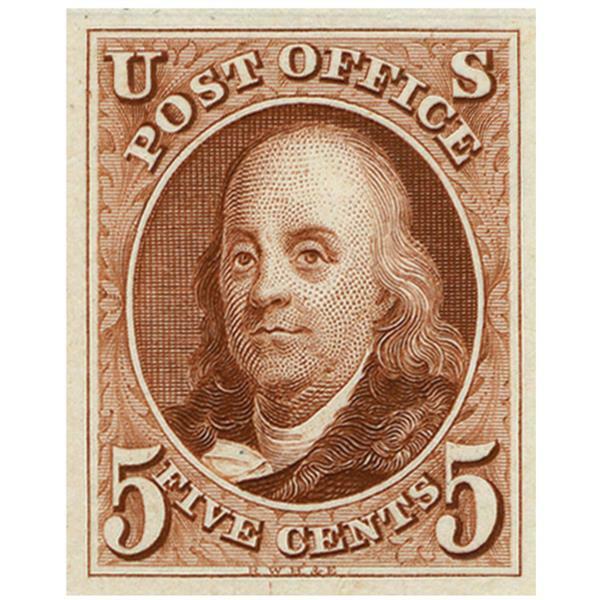 In 1775, when the American Revolution began, Franklin was the obvious choice for starting the new mail system, and the Continental Congress appointed him the first postmaster general of the United States. Soon, mail was flowing from Portland, Maine, to Savannah, Georgia. Franklin standardized rates, surveyed routes, erected milestones along long-distance delivery routes, and slashed delivery time between major cities by half. Franklin donated his salary for relief for wounded soldiers. 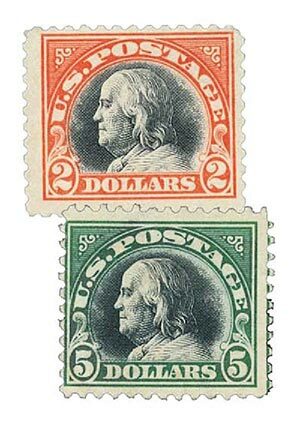 U.S. #523-24 – Click the image to read the interesting story behind these stamps. As the war progressed, it quickly became obvious that an alliance with France could ultimately decide the outcome of the Revolution. Late in 1776, at the age of 70, Franklin traveled to France to secure an alliance. He received a hero’s welcome in Paris. The French appreciated Franklin’s kindness and wisdom, but were hesitant to enter a war against the British. However, Franklin remained persistent. After the British surrender at Saratoga, the French were sufficiently impressed. On February 6, 1778, the French signed a pact with the United States. Franklin immediately arranged for transportation of French officers, soldiers, and guns to America. He remained in Paris and kept generous gifts and loans from France flowing to America. Historians believe that without France’s assistance, the United States would have lost the war. Franklin was the only person to sign all four of the key documents in United States history: the Declaration of Independence, the Treaty of Alliance with France, the Treaty of Paris with Great Britain, and the Constitution of the United States. He died on April 17, 1790. As a statesman, he stands among the top rank of the people who built our nation. 9 Responses to "This Day in History… January 17, 1706"
Wasn’t the surrender of Yorktown in 1781? I believe the French were involved with the battle and more importantly the French Fleet closed off the escape route (in the Chesapeake Bay) to the Atlantic Ocean from the British. Since the King had bigger problems in Europe, the war was over in the colonies. Sure glad that we have each other to keep history straight. The above statements are correct. I know! I was there buying stamps from Ben. I believe Franklin spent time in England that caused him some grief both in England and in the colonies. This seems to be skipped. Yes, Franklin took a beating at the Privy Council, the King’s own advisory council. There, in Jan. of 1774, Franklin had been summoned to explain how he had come into private letters of the British government overseeing Massachusetts that asserted that the colonists’ right might need some abridging. Ironically, Franklin had no intention of undermining British control over the colonies. He loved Britain. He just hoped for more humane leaders. Notwithstanding his own love for Britain, however, he was brought to the well of the Privy Council and made to stand there for an hour being humiliated by “his betters” as a traitor and instigator of the problems in Boston. He had come to the meeting a faithful British citizen; he left a member of the Revolution. Your articles and the subsequent comments have a very positive influence. I want to pick up a book. History of the American Revolution deserves a lifetime of study. What an interesting, devastating, victorious, and wonderful time to be alive. Thanks to the people who made America Great. And of all the great Founding Fathers, he was probably the only one not to serve as President. Not everyone can be president. Franklin surely knew this at the time of the first presidential election in 1788–he was 82, with just two years left to live. However, he was not the only founding father who never became president. Samuel Adams, John Hancock and Patrick Henry also come to mind. And don’t forget Alexander Hamilton, who was “locked out” of the presidency because of his offshore birth on the Caribbean island of Nevis. ALL the founding fathers deserve our thanks, presidents or not.